Elite Survey Sites team has taken the time to go through all international and UK-exclusive survey sites, for the purpose of determining the best opportunities for panelists in the United Kingdom. We have narrowed down the many existing panels to a short list that allows UK registrants. If you live in the UK these are the sites you can trust. Before getting in-depth we’re going to quickly show you how each of the top 5 paid survey sites line up against each other. Register and Get 10 Points! Very Easy and Short Surveys! Weekly Payments for Gold Members! With all that in mind, we’re going to take a more detailed approach towards explaining what each of the top 5 UK survey sites offers you. This includes looking at how you can maximize your points earned and how you can redeem them at the highest value possible. You can make an easy £1 to £4 off most of their surveys. In 2015 alone, their UK panelists made more than £3.5 million for completing paid surveys. This is a very strong number when you factor that it’s just counting their members in the United Kingdom. 1. Their surveys are well-paying, frequent, and you can rest assured that you’ll get paid. 1.There is currently no Opinion Outpost app. 2. Most cash-out methods only take a few days max to fully process. 2. The quarterly draw only has one prize winner, making your odds of winning low. 3. If you get screened out, you still have a chance to earn points through their instant win game. 3. The profile surveys aren’t very fun, but if you do them right you’ll have a better chance of getting good survey offers. 4. You can earn an easy £1 per friend that signs up under you and completes a survey. 4. There are not very many payment options for you to choose. You could potentially make £100 to £300 a month as an Opinion Outpost UK panelist! Plus, there’s a draw that takes place four times a year with a £5,000 grand prize for a single winner. With Opinion Outpost being one of the most legitimate survey panels around, this is potentially the largest single score you could make off paid surveys. And even better, getting disqualified from a survey has become less of a pain. 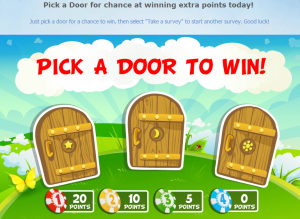 You will be presented with a chance to play their instant win game called ‘Opinion Outpost’s Door Game’. This game pays out 0, 5, 10, or 20 points depending on what’s behind the door you choose. This means you could win nothing, 25 pence, 50 pence, or 1 pound. Get your friends to sign up through you via your referral link. 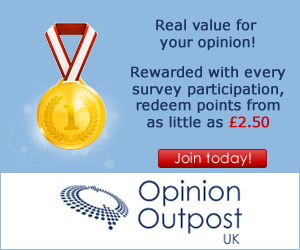 Opinion Outpost pays out £1 for every friend that joins under you and finishes a single survey. This is a super easy way to build up your balance! Don’t rely on their survey invites by email to find opportunities to make extra cash here. You can sign in and see other available offers. Typically, there will be more paid surveys that you can access once you log-in. These are ones that won’t be directly sent to you. You sometimes have the option to do a survey that gives you an entry into their draw. This is usually not worth the time as you could be spending it doing a survey that guarantees at least a little compensation. Other than that, just stay active. This is one of the best-paying survey sites on the Web and many regular panelists have high hourly pays while doing surveys for them. We highly recommend you take the time to make Opinion Outpost one of your regular sites. The best way to cash out is through PayPal, and it will show up within a few business days. The other withdrawal methods are all quick though. We only suggest that you cash out for sweepstakes entries sparingly. It’s more rewarding to take the direct payout if you can, and you can manage to add up a fair bit of earnings on here if you’re consistent. This is the best international paid survey panel on the Web. You can bank an easy £3 to £9 per day on here. Many Toluna panelists receive as much as three to five surveys on average, every single day. There are even focus group offers that come once and awhile, which reward up to £150 for an hour or two of your time. 1. You will have new survey offers sent by email … expect up to 5 paid surveys daily! 1. Withdrawals can take as much as 8 weeks to process, but it usually takes under a week. 2. You can make as much as £25 per survey or £150 from focus groups. 2. You could get a lot of emails, since they send out the survey offers as they come available. 3. They are 100% legitimate, with a longstanding history of making good on withdrawal requests. Although slow, they always pay out. 3. There have been reports of unexpected account closures, due to various types of violations to their Terms and Conditions. 4. You can get paid for posts and for creating polls for the Toluna community to do. 4. Getting disqualified from surveys is a semi-frequent thing, which is frustrating. You could potentially make £100 to £300 a month as a Toluna UK panelist! Approximately 1,500 to 20,000 points per completed surveys. Next, it’s important to know about the other paid tasks they offer. Paid forum posts. All you have to do is jump into the discussion in Toluna’s community forum and you will get paid for it. Further, you can make money by referring friends — you get 500 points for each one that signs up with your link. This can add up quickly as the only real requirement to receive the reward is that the referred member must fill out their ‘Interests” survey after signing up. 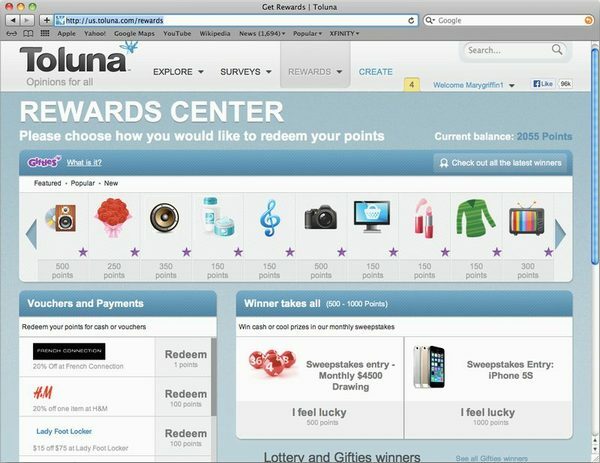 Toluna UK users can redeem their earned points through any of the following options: PayPal, Amazon vouchers, physical gift cards, and merchandise. The most rewarding way to cash out is through the ‘Gifties’ feature. What does this offer you exactly? It gives you the chance to buy tickets with your points to enter into a draw to win a particular prize. It only takes a small amount of points to buy a ticket into any of these draws. Even if you aren’t the gambling type, you can still take advantage of this feature. Once you request a withdrawal, you can just put your leftover points into Gifties entries and hope for the best. All said and done, Toluna has endless ways for you to make money and you can maximize the value of your points if you play your cards right. This is a smaller survey panel, but it’s dedicated to British panelists. In fact, you have to live in the UK in order to be able to be a member here. There are regular £100 draws that you have a chance to win. This is a nice added perk of being a regular panelist at SurveyBods. You are getting rewarded anywhere from 50 pence to £3 for each survey you do. This adds up quickly as you can easily finish a survey in 7 to 15 minutes. You only need £15 to request a withdrawal. 1. Every time you do a survey you get another entry in their monthly prize draw. 1. If you get screened out all you will receive is an entry in the monthly prize draw. 2. They have a loyalty system that rewards more per survey as you level up. The Bronze, Silver, Gold, Platinum, and Diamond badges exist. Diamond takes 30 surveys to earn. 2. Any bank transfer withdrawal could easily take up to three weeks to complete. Sometimes it will arrive in 1-2 weeks at the very best. 3. If you don’t have a physical address in the UK you won’t be able to join and participate. 3. A lot of their surveys only reward you with entries into their sweepstakes. 4. Most surveys take 7 to 12 minutes to complete. 4. There aren’t any really cool features or fun ways to redeem your earnings. 5. You only have to be 11 years old to join, so long as you have your parent’s permission. 5. Sometimes the screen-outs happen in high frequency and this can be frustrating. 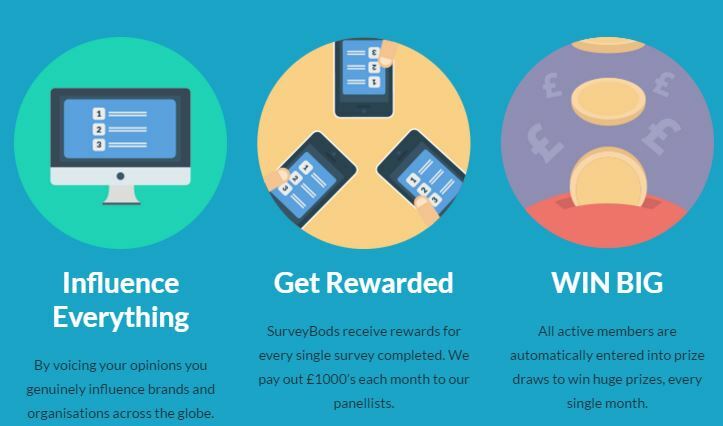 You could potentially make £50 to £100 a month as a SurveyBods panelist! Unfortunately, there are not very many opportunities to increase the amount you earn on SurveyBods. You just need to take the surveys as they come to you. The money will add up quickly if you always jump on opportunities when they’re around. You only need £15 to withdraw so it’s not all that bad. You will be able to make some extra bucks off this site for sure! You will get 50 pence for each of the four profile surveys they give you. This will be an easy £2 which means you are only £13 in surveys away from getting your first withdrawal. Once you have at least 1,500 points you can make a withdrawal request. Each point is worth one pence, so a 1,500 point withdrawal would make a £15 cash-out. You can do this any number of ways, but an Amazon voucher would come the quickest. If you just want it in cash form, both bank transfer and check by mail is an option. You could always just get a Tango gift card instead, which can be used at many different retail stores. Global Test Market established back in 1999 and they haven’t ever had any major reputation blemishes. Most of the legacy survey sites died off or got labeled as scams over the years. But this company managed to stay ahead of the curve; they even have a wonderful app that makes making money even easier. We strongly recommend them to any panelist, whether you’re limited to the UK panels only or even if you have access to US survey sites also. You’ll truly love earning here; their surveys are easy and short, so you can rack up points really quick! 1. It is easy to earn a bunch of points, especially since most pay at least £1 and you can sometimes get multiple invites in one day. 1. You need at least £32 (1,000 points) in order to make a withdrawal request. This will take a little while to rack up, but many do it in their first month on the site. 2. In 2014 alone, the company paid out in excess of 32 million USD, which equates to about 24 million GBP in present day. 2. Your withdrawal could take between 6 and 8 weeks to go through. 3. Most surveys only take between 10 and 15 minutes to complete, and they generally aren’t too boring. 3. There have been reports of accounts getting closed for suspicious violations of their Term of Conditions. 4. There is a $300 daily and $5,000 quarterly sweepstakes draw; if you win, they will convert to GBP to pay you. 4. Each draw only has one winner, which makes it very hard to actually win a prize. You could potentially make £75 to £150 a month as a regular Global Test Market panelist! Global Test Market sends out focus group invites to their loyal panelists from time to time. If you stick around and do surveys regularly for them this could add £25 to £100 for just an hour of your time. There is even the rare focus group paying £100 to £200 for closer to two hours of time. If you’re going to be a regular survey taker, make sure to stick it through with Global Test Market. The nearly two-month wait for your cash-out is certainly a huge pain. If you stay consistent here, then you will have a constant flow of income coming in from this site. Also, since their draws only have one winner it’s recommend that you do not buy sweepstakes entries with points. It’s better to just save up your leftover points after you make a withdrawal as well. 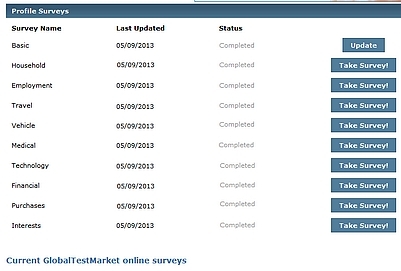 The horrible thing about Global Test Market is the slow withdrawal times. Their North American members typically receive their cash-out within 4 to 6 weeks. Unfortunately, the UK panelists and other international users only get their withdrawal to them within 6 to 8 weeks. If you take an Amazon gift card instead, you will get paid much quicker. The same goes for other physical gift cards offered for points. However, the absolute best (and fastest) way to get paid is usually via PayPal. Pinecone Research is one of the older survey sites. It has always been one of our top recommendations. The only major complaint we’ve ever had is that they sometimes don’t have many surveys available. Even so, you can usually make a fair chunk of change every month on here. Most users receive a minimum of two survey invites weekly. At £3 per survey, that’s approximately £24 a month off just doing two surveys a week for them. This is a fair rate, considering each of their surveys typically take about 10 to 15 minutes to complete. So you’ll spend about 2 hours to bank £24 each month off here. Since they send you survey offers, there’s also no need to log-in daily. 1. You make about £12 per hour of time spent doing surveys here. This is more than what you can typically expect to make elsewhere. 1. You don’t get a whole lot of surveys here. The most you can expect in a week is five, but a lot of the time you get one to three a week. 2. There’s no minimum cash-out requirement since all their surveys pay at least what you need to make a withdrawal request. 2. They don’t have a quarterly or an annual prize draw with a substantial payout. 3. You can get your withdrawal in as little as three to five business days. 3. Sometimes you will get screened out mid-way through a survey. 4. There are bi-weekly draws which you get an entry to every single time you do a survey. 4. You won’t know if you can sign up until you try, as registration is sometimes closed. You could potentially make £25 to £50 a month as a regular Pinecone Research panelist! Pinecone Research doesn’t have any special reward schemes. You just get paid for doing surveys, winning prize draws, and testing products. There also aren’t any loyalty programs that incentivize sticking around. At best, you have more chances at winning in their prize draw if you complete more surveys since each one gives you an extra ticket. So just stick around and complete surveys as they come to you. There will be some product testing opportunities that come your way as well if you stay loyal. These pay a small bit, and you get to keep whatever you test for them too. You might want to let your balance add up for a bit. If things ever dry up, you can just request whatever you have saved since you’re guaranteed to be past your cash-out minimum. Then you can save towards merchandise that you want instead, which often gives you a better value for your points. There are numerous ways to cash out through Pinecone Research. The most common is by check; they’ll mail you a check as small as £3 if you request a withdrawal after doing a single survey. The PayPal option makes everything a lot simpler, and a little quicker. When it comes to doing paid surveys online in the UK, the five panels covered here stand out as being some of the best. If you actively did surveys for each of the five sites, you could expect to make as much as £350 to £950 a month. This is just what you can expect off doing the surveys; if you take up any paid focus groups or product testing opportunities, you could make even more. It is true that paid panelists in the UK can earn £1,000 or more a month doing surveys online. It just takes consistency and knowing which sites to join. Each of the five listed here are good for many reasons. When deciding how to rank them, we made sure to look at more than just whether they accept UK registrants. We also made sure that screen-outs are infrequent, rewarding or non-existent. Because one of the biggest problems with many international survey sites is the frequent screen-outs, which often happen near the end of your survey. But to choose the highest quality panels you have to ignore the ones with less surveys and poor reputation. This can come at a cost; a few of the survey sites listed here have very slow withdrawal speeds. It is fine as long as you stay active for many months though, as the delay would only be noticed at first. Paid survey sites are a great way to make extra money. It can be a little confusing if you’re new to the game though, especially since most of these sites tailor towards Americans. You’re going to have to do a little extra leg work to find out which sites are best for you and what they offer to Britons. We are going to answer some questions you might have now to help you out quicker, but if you’re still wondering anything just comment and ask below. What do survey sites pay you to do? You get compensated for doing surveys. They could run from a few minutes to upwards of half an hour most of the time. Generally, surveys pay in the £1 to £5 range and they take about 10 to 30 minutes to complete. What do you get paid for doing surveys? 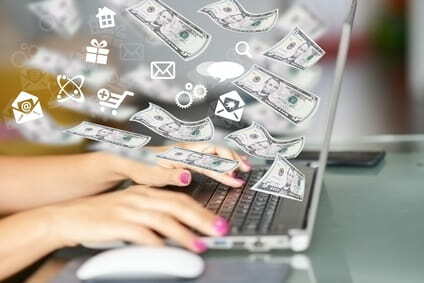 Most sites reward you with points, although there are some that value everything in cash. Certain survey panels also reward you for product testing, focus groups, and more. Then there are contests and prize draws that happen either once and awhile or on a recurring basis. What does it mean to get screened out from a survey? Getting screened out is the equivalent of getting disqualified from a survey. It could happen early on or later into the survey. You might or might not get rewarded for getting screened out, but most will give you sweepstakes entries. Some, like Opinion Outpost, pay you points even when you get screened out and the amount you get paid can even vary based on how far into the survey you were. How do British panelists get paid? The most common payment options for online surveys in the UK include PayPal, check, gift cards, e-vouchers, and sweepstakes entries. Sometimes you can even get paid by bank transfer. Further, there are certain survey panels that let you withdraw for merchandise. You have to do a little extra math to see what type of value you are getting for your points this way. Otherwise, it would be possible to get much less for your points than you would’ve if you requested a check or PayPal payment.